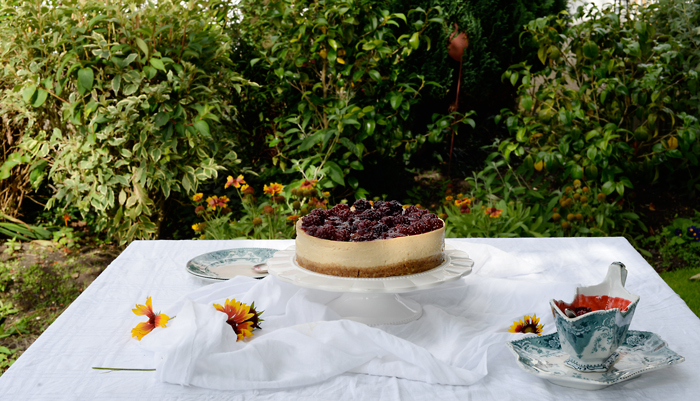 Lemon & Vanilla: Baked Muscovado and Hazelnut Cheesecake with Blackberries for the Sweet World / Cheesecake (no forno) de Açúcar Mascavado e Avelãs, com Compota rápida de Amoras para o Sweet World. 20th of September and it's time for another Sweet World Challenge and this month, we decided to invite you to bake a Cheesecake. Yes, it has to be baked! Cheesecake is a dessert that has stood the test of time. From its earliest recorded beginnings on Samos over 4,000 years ago to its current iconic status around the world, this creamy dessert remains a favourite for sweet teeth of all ages. The first cheesecake was probably produced on the Greek island of Samos. Back then, this delicious dessert was believed to be a powerful source of energy. Even during the first Olympic Games in Greece, in 776 BC, cheesecakes were served to the athletes. Wedding couples were also served and cherished with this amazing dessert. 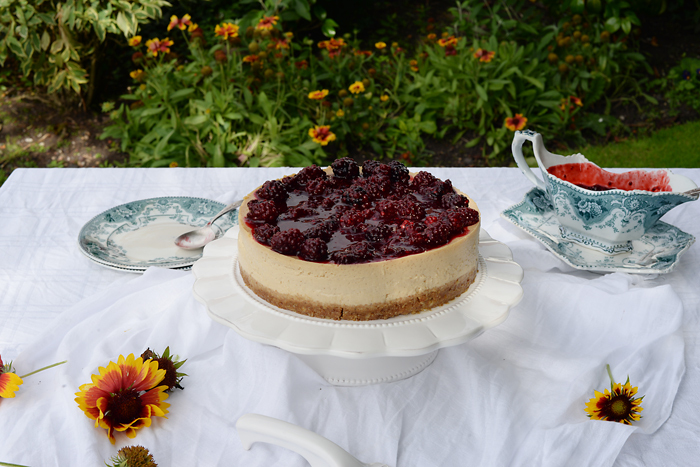 The New Yorkers fell in love with cheesecakes back in the 1900s. The credit for the creation of the NY cheesecake is bestowed upon Arnold Reuben (1883-1970). Even though he is best known for his signature sandwiches, Arnold Reuben is generally credited for creating the New York Style cheesecake. Reuben was born in Germany and he went to America when he was young. The NY styled cheesecake was actually an experiment that Reuben did with a cheese pie. 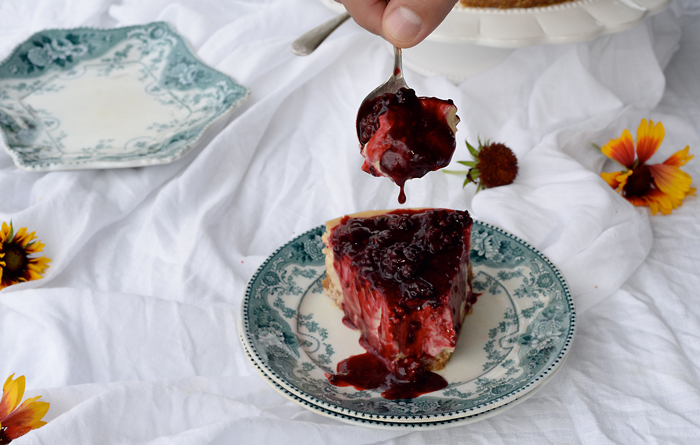 He was invited to a party where he was served with a cheese pie, and he was so dodged by the dish, that he started experimenting with it and came up with what we know today, as the NY Cheesecake. The Classic New York style cheesecake is served with just the cake - no fruit, chocolate or caramel is served on the top or on the side. This famously smooth-tasting cake gets its signature flavour from extra egg yolks in the cream cheese cake mix. 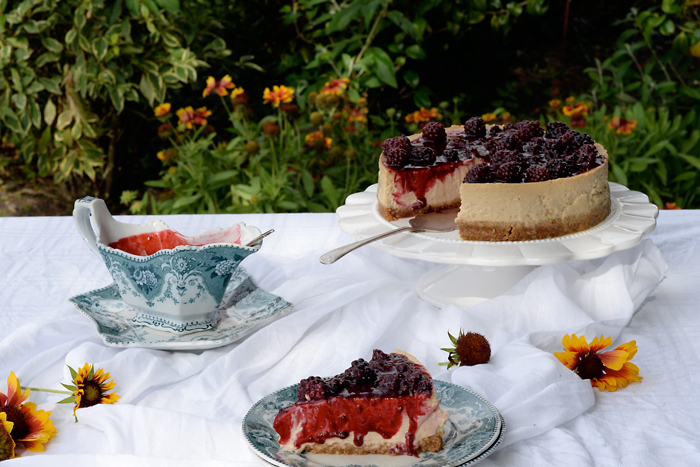 Saying that, New York is not the only place in America that puts its own spin on cheesecakes. In Chicago, sour cream is added to the recipe to keep it creamy. Philadelphia cheesecake is known for being lighter and creamier than New York style cheesecake and it can be served with fruit or chocolate toppings. In St. Louis, they enjoy a gooey butter cake, which has an additional layer of cake topping on the cheesecake filling. Each region of the world also has its own take on the best way to make the dessert. Italians use ricotta cheese, while the Greeks use mizithra or feta. Germans prefer cottage cheese, while the Japanese use a combination of cornflour and egg whites. 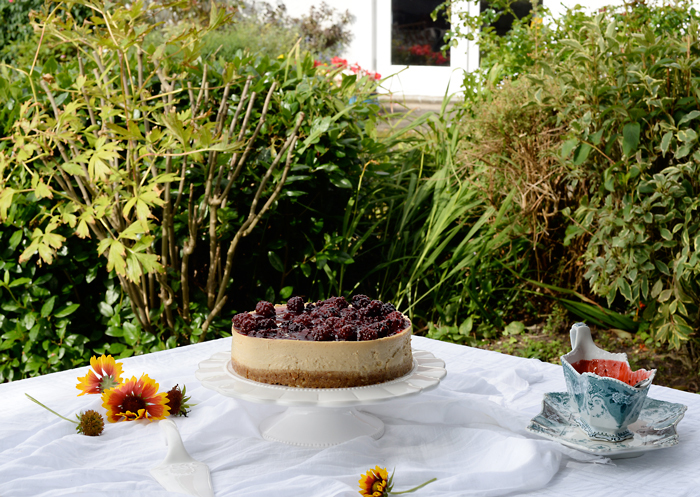 There are specialty cheesecakes that include blue cheese, seafood, spicy chilies and even tofu! 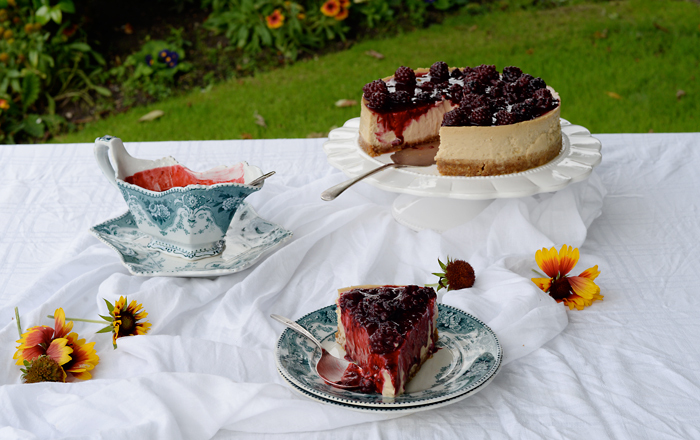 Despite of all the variations, the popular dessert’s main ingredients - cheese, wheat and a sweetener - remain the same so, if you're interested, choose the kind of cheesecake you want to make and BAKE IT! 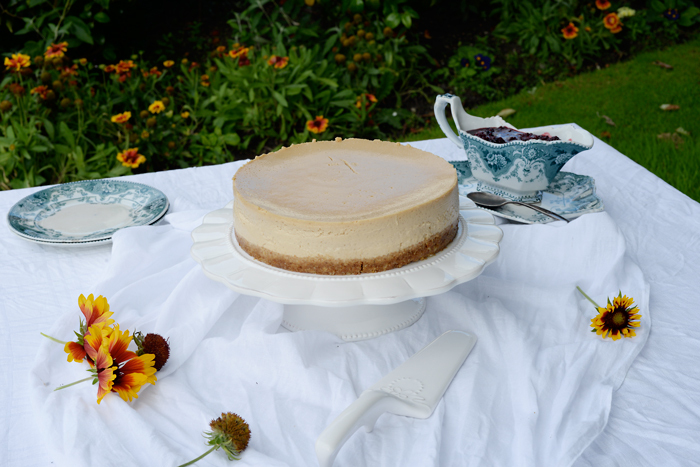 You have until the 20th of October to make and publish your Baked Cheesecake. That same day, 20th of October, Susana will let you know in her blog, the theme for the next challenge. You'll have to leave the link for your participation here, in this post, in order to be featured in the monthly round up that will be published on the 25th of October. 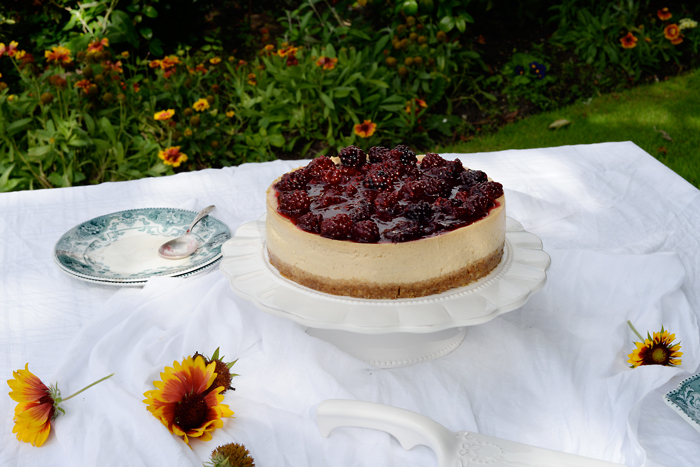 The cheesecake I decided to bake was this one, featured in the September issue of BBC Good Food magazine and it's topped with blackberries. From what I read, perfect baked cheesecakes should have a very smooth and creamy texture inside and no cracks on top. To be truthful, I was very happy with the top of my cheesecake as it had no cracks at all, until the moment I transferred it from the baking tin onto the serving plate and it got a little crack on top. Nothing to be very worried or upset about and the flavour and creaminess of it was unbelievably delicious. Lightly grease the base and sides of a 20cm springform tin and line the base with baking paper. Wrap the outside of the tin with 3 layers of foil, making sure there are no gaps for water to seep in. Put the prepared tin inside a high sided baking tray and set aside. Put the biscuits and 50g of the hazelnuts in a food processor and blitz to fine crumbs. Add the butter and blend again until well combined. Tip the mixture inside the prepared tin and press it into the base. Chill for 10 minutes. In a saucepan, heat the muscovado sugar and the milk, until the sugar has dissolved. Set aside to cool. In a bowl, beat the cream cheese, flour, vanilla and eggs, until smooth. Stir in the soured cream, Frangelico (if using) and the cooled sugar mixture, until well combined. Boil the kettle and fill the baking tray halfway with boiling water. Bake for 10 minutes, on the middle shelf of the oven. After 10 minutes, reduce the oven temperature to 110ºC and cook for a further 30 minutes. Turn off the oven but keep the door closed for 1 hour, then open the door slightly and cool for another 1 hour. To make the topping, put the cornflour, caster sugar and half the blackberries in a saucepan and set over a high heat. Cook for 3 to 4 minutes, squashing the blackberries a little, until syrupy. Toss in the remaining berries, heat through, then remove from the heat and cool until ready to serve. Roughly chop the remaining hazelnuts and toast in a frying pan. To serve, remove the cheesecake from the tin, remove the baking paper and transfer to a serving plate. Top with the berries and the toasted hazelnuts (I forgot my hazelnuts...). 20 de Setembro, dia de vos apresentar mais um desafio e de mais um tema para o nosso Sweet World! Este mês, e para fazer a transição Verão/Outono-Inverno, a Susana e eu, decidimos desafiar-vos a fazer um Cheesecake no Forno! Sim, tem de ser no FORNO. Não nos apresentem Cheesecakes de frigorífico, pois não serão considerados válidos. 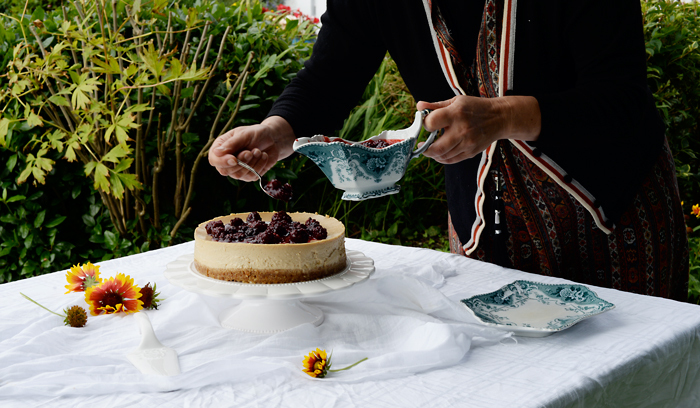 O Cheesecake é, sem sombra de dúvidas, a sobremesa que mais sobreviveu inalterável na sua essência através dos tempos e que ainda hoje é um favorito quer para miúdos, quer para graúdos. Diz-se que o primeiro cheesecake foi criado na Ilha grega de Samos, há cerca de 4.000 anos. Os gregos acreditavam que esta deliciosa sobremesa era uma poderosa fonte de energia e como tal, aquando dos primeiros jogos Olímpicos na Grécia, em 776 AC, o cheesecake já era servido aos atletas. Tal era a crença no poder energético do cheesecake que, em casamentos, esta era a sobremesa servida aos Noivos como forma de os abençoar. Os Nova-Iorquinos apaixonaram-se por esta sobremesa em 1900. Os créditos para a criação do famoso NY Cheesecake, são atribuídos a Arnold Reuben (1883-1970) que, embora seja mais conhecido pelas fabulosas sandes que fazia, é considerado o criador deste famoso cheesecake. Reuben era um alemão que ainda novo, foi viver para a América. Diz-se que a criação deste cheesecake foi uma experiência deste alemão, baseada numa Pie de queijo que lhe foi servida numa festa para a qual havia sido convidado. Reuben ficou tão fã da dita Pie de queijo, que resolveu tentar recriá-la, tendo assim nascido o tão famoso New York Cheesecake. Existem várias versões de cheesecake por toda a América, sendo que, o clássico NY Cheesecake é servido simples, sem adições de toppings ou acompanhamentos. Uma das características principais do Cheesecake Nova-iorquino, é o seu interior extra cremoso que, de acordo com o que li, só é possível obter, através da adição de gemas de ovo à mistura base, onde o queijo creme é o ingrediente principal. Em Chicago, adicionam soured cream (natas azedas) à mistura. Em Filadélfia, o cheesecake é famoso por ser mais leve e cremoso que o cheesecake Nova-iorquino e é, nesta região, servido com fruta ou chocolate. Em St. Louis, colocam uma extra camada de base (sendo esta de bolacha ou bolo), no topo do cheesecake. Não só na América mas em várias partes do Globo, se fazem diferentes versões de cheesecake e, em cada uma das diferentes zonas, são utilizados diferentes tipos de queijo (ou não), no recheio. Por exemplo, os italianos usam queijo ricota, os gregos usam mizithra ou feta, os alemães usam requeijão e os japoneses usam uma mistura de Maizena e claras de ovo, em vez de queijo. Existem ainda outras versões de cheesecake cujos ingredientes utilizados são, queijo azul, frutos do mar, malaguetas picantes e até Tofu! O certo é que, apesar de todas as versões existentes, o queijo, o trigo e o adoçante são e serão sempre, a base do verdadeiro cheesecake. Assim sendo e escrito o que atrás está escrito, escolham a vossa receita, a vossa versão de cheesecake, levem-no ao forno e tragam-no para o Round up do nosso Sweet World! Têm até ao dia 20 de Outubro para fazer e publicar o vosso Cheesecake no Forno. Nesse mesmo dia, 20 de Outubro, será apresentado, no blogue da Susana, o tema para a próxima edição do Sweet World. Têm mesmo de deixar o link da vossa publicação neste post, para que possam fazer parte do Round up mensal, que aqui será apresentado no dia 25 de Outubro. Esta foi a versão que decidi fazer. Um cheesecake no forno, com açúcar mascavado, queijo creme e natas azedas (soured cream) e cujo topping é uma compota rápida de amoras. A receita vem na revista BBC Good Food de Setembro e foi um sucesso entre os comensais que o degustaram. Do que tenho lido e aprendido ao longo dos tempos sobre cheesecakes, duas das principais características de um perfeito cheesecake no forno são: o interior cremoso e aveludado e que não pode (ou deve) estar rachado quando sai do forno. Pois de acordo com estas características, garanto-vos que fiz o cheesecake perfeito! Super cremoso e aveludado no interior e a pequena rachinha que vêm no topo e a qual fiz questão de vos mostrar, foi feita devido à minha falta de jeito ao desenformá-lo e ao passá-lo para o prato de serviço. Quando saiu do forno estava com uma superfície perfeitamente lisa e sem rachas. Ainda de acordo com o que tenho aprendido, o interior cremoso só é possível obter se o queijo creme estiver á temperatura ambiente antes de ser batido. Quando digo à temperatura ambiente e, como é óbvio, de acordo com a temperatura, o queijo deverá ser retirado do frigorífico um bom par de horas antes de ser batido. Para prevenir as rachas no topo, depois de cozido, o cheesecake deve arrefecer no forno por cerca de 2 horas, factores que, nesta receita, até são especificados. Untar uma forma de 20cm de diâmetro, de fundo amovível e com aro e forrar a base com papel vegetal. Envolver o exterior da forma em 3 camadas de folha de alumínio, tendo o cuidado de não deixar buracos, para que não entre água, enquanto esta está no forno a cozer em banho Maria. Colocar a forma preparada num tabuleiro de lados altos e reservar. Aquecer o forno a 200ºC (sem ventoinha - se o vosso forno tiver ventoinha, aquecer a 180ºC). Colocar 50g das avelãs e as bolachas no copo do robot de cozinha e processar até obter uma mistura areada. Adicionar a manteiga derretida e voltar a processar, até todos os ingredientes estarem bem incorporados. Espalhar a mistura sobre a base da forma preparada, alisando e pressionando bem a superfície. Refrigerar por cerca de 10 minutos. Num tacho, aquecer o açúcar mascavado com o leite, mexendo, até o açúcar estar dissolvido. Reservar e deixar arrefecer. Na taça da batedeira eléctrica equipada com o balão, bater o queijo creme, a farinha, a baunilha e os ovos, até obter uma mistura cremosa. Adicionar as natas azedas, o Frangelico (caso usem) e a mistura arrefecida do açúcar e voltar a bater até obter uma mistura cremosa e homogénea. Deitar a mistura na forma preparada. Encher o tabuleiro com água a ferver, até esta estar a meio da altura da forma. Levar ao forno e cozer, no meio do forno, por 10 minutos. Findos os 10 minutos, baixar a temperatura do forno para 110ºC e cozer o cheesecake por mais 30 minutos. Desligar o forno e deixar o cheesecake a arrefecer por 1 hora. Finda essa hora, entreabrir a porta do forno e deixar o cheesecake arrefecer por mais 1 hora. Findo esse tempo, retirar a forma do forno e do banho Maria e refrigerar por 4 horas, ou de um dia para o outro. Para fazer a compota de amoras, colocar metade das amoras num tacho, juntamente com a Maizena e o açúcar amarelo. Sobre lume alto, cozinhar por cerca de 3 a 4 minutos, esmagando as amoras com as costas da colher de pau, por forma a obter uma mistura com a consistência de xarope. Adicionar as amoras restantes, envolver tudo muito bem, retirar do lume e deixar arrefecer completamente antes de servir. Entretanto, picar grosseiramente as avelãs restantes e tostá-las numa frigideira seca. Na hora de servir, desenformar o cheesecake, descartando o papel vegetal da base. Decorar a superfície do cheesecake com a compota de amoras e com as avelãs tostadas (eu esqueci-me das avelãs...). Recipe / Receita: BBC Good Food magazine (September 2016). Etiquetas: BBC Good Food., Blackberries / Amoras., Cheese / Queijo., Cheesecakes., Frangelico., Hobnob biscuits / Bolachas Hobnob., Soured cream / Natas azedas., Sweet World., Vanilla / Baunilha.